AthTek Data Recovery is professional Windows Data Recovery software. It can both restore operation system and recover deleted files and folders from Windows Partition. Simply click Ctrl+R when booting, operating system can be restored. It allows user to recover deleted files even the files has been removed from the Recycle Bin. All these are very simple and convenient. Just by few clicks everything gets done. 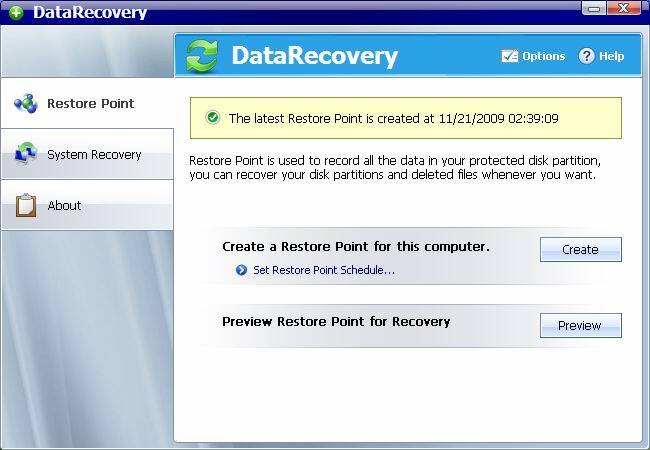 A reliable tool for operating system restoration and deleted files recovery. 15% free space of disk partitions. Defragment system disk before installation. ...... Manual, Automatic, Scheduled Restore Point will be created as user's option. AthTek Data Recovery helps user to restore Windows Operating System quickly and conveniently. AthTek Data Recovery compresses all the data of system partition and saves them to a hidden partition on the hard disk. Once the system partition is attacked by Virus, Trojan, Spyware or something else, user is able to wholly restore the system partition by one click. AthTek Data Recovery can restore the Windows Operating System even in system crashes. By using the Ctrl+R keys before accessing Windows, user can also run the PreRecovery Mode to restore the Windows Operating System. Data recovery software for Microsoft Windows family operating systems. A Free Data Recovery Tools contains a collection of DIY recovery tools. Data Doctor Pen Drive data recovery software. Undelete and restore lost audio video files and folders from your media. Data Recovery Novell to recover lost data from damaged Novell volumes. Rocover lost or accidentally deleted data from Win. NT, XP, 2000 etc. Qweas is providing links to AthTek Data Recovery 3.01 as a courtesy, and makes no representations regarding AthTek Data Recovery or any other applications or any information related thereto. Any questions, complaints or claims regarding this application AthTek Data Recovery 3.01 must be directed to the appropriate software vendor. You may click the publisher link of AthTek Data Recovery on the top of this page to get more details about the vendor.